The 9th Annual Salute from the Shore will begin, as always, at 1:00 PM on July 4th in Cherry Grove, SC, just north of Myrtle Beach. 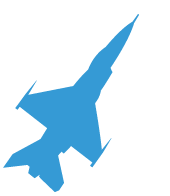 This year’s Salute will include a flyover of F-16s from the 169th Fighter Wing at McEntire Joint National Guard Base, as well as a fleet of vintage military aircraft. The flight will include a loop through Charleston Harbor and, for the first time ever, a Salute over Lake Murray! The jets will fly over Spence Island on Lake Murray around 1:45. Organize your patriotic displays in groups, big and small, and share your tributes online for our armed forces around the world to see. Please share this schedule and information with your friends and family! Salute from the Shore is a 4th of July tradition like no other! Thank you to everyone who participated in thanking our military at this year’s Salute from the Shore. It was a day to remember! A huge thanks goes to the pilots at the 20th Fighter Wing at Shaw Air Force Base and to the pilots and flight crew at Charleston Air Force Base. Also, we cannot thank enough the airmen on the ground in Sumter and Charleston who helped make this possible. 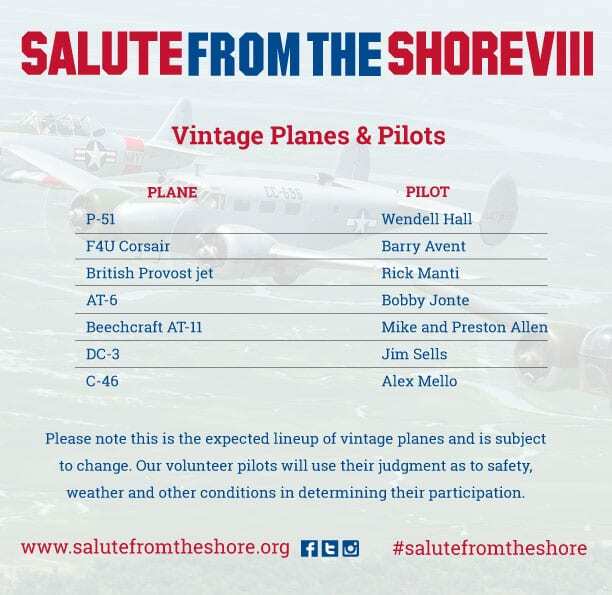 Finally, we very much appreciate the efforts of our volunteer vintage pilots (note graphic below to see who they were). Most of all, thank you to all of YOU for showing up on the shores of South Carolina to salute these planes in appreciation of the service and sacrifice of the military. We are able to celebrate and enjoy the 4th of July because of the freedom they provide. And thanks to all of the many people who follow us on social media and on our website, and who offer encouragement and enthusiasm towards our cause. 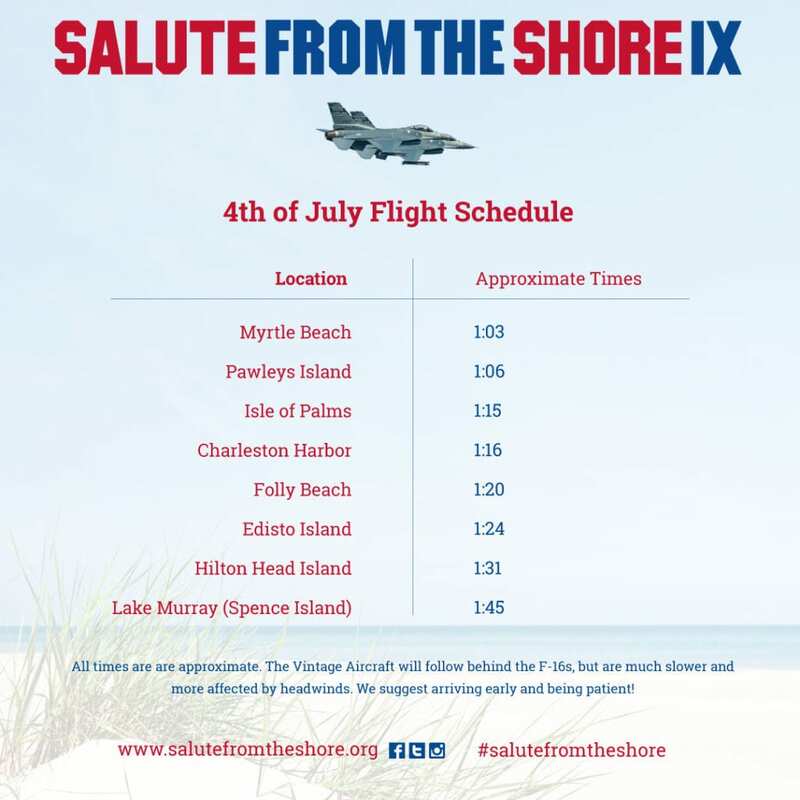 Don’t forget to share your photos and videos and include #salutefromtheshore and #afflyover…Or you can email them to salute@salutefromtheshore.org. Thank you again for helping make Salute from the Shore a 4th of July tradition in South Carolina! The 8th Annual Salute from the Shore will begin, as always, at 1:00 PM on July 4th in Cherry Grove, SC, just north of Myrtle Beach. 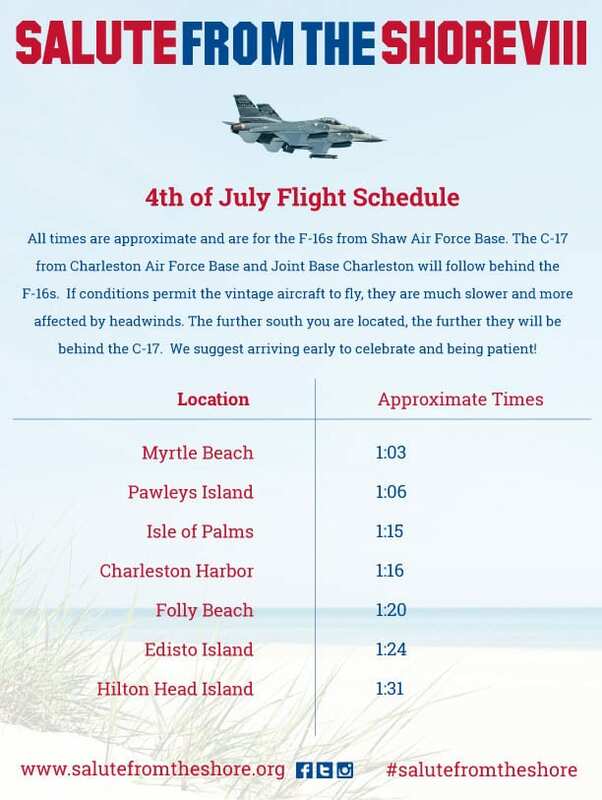 As noted below, all times are approximate and are for the F-16s from Shaw Air Force Base. The C-17 from Charleston Air Force Base and Joint Base Charleston will follow behind the F-16s. If conditions permit the vintage aircraft to fly, they are much slower and more affected by headwinds. The further south you are located, the further they will be behind the C-17. We suggest arriving early to celebrate and being patient! Watch the video below to start getting ready for the big day next week – the 4th of July! 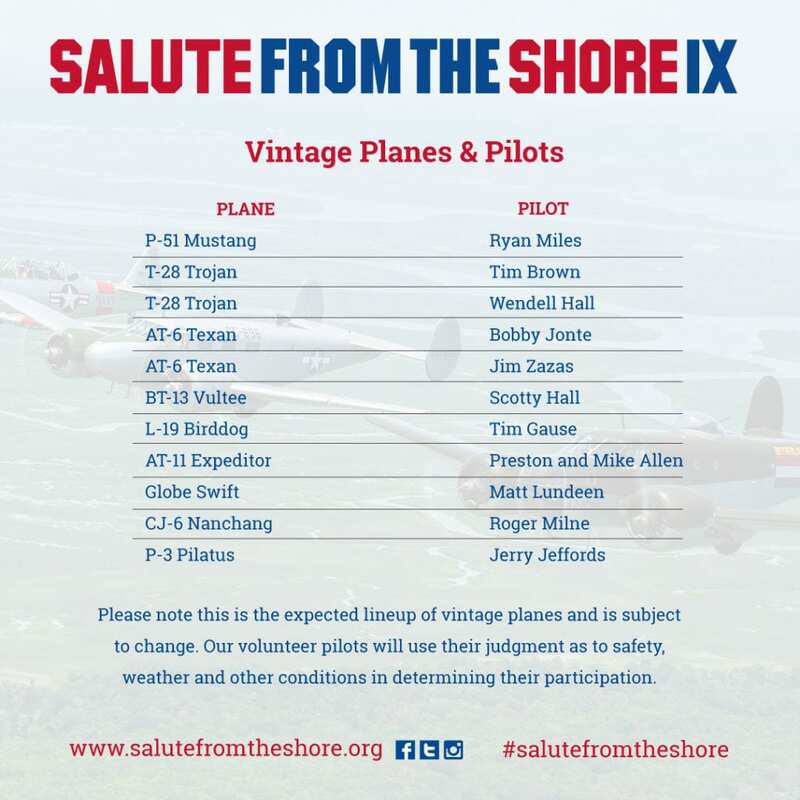 Salute from the Shore is only one week away! We hope you’re making plans to get to the South Carolina coast in your red, white, and blue! Almost 10 years ago, a few South Carolinians decided they wanted to give a big “thank you” to our military. From that, Salute from the Shore was created as annual 4th of July military flyover of the South Carolina coast. Salute from the Shore’s mission was simple – it was to remind people of the men and women overseas protecting our country. 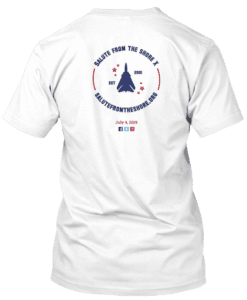 Since the creation, there have been millions of salutes and a vast assortment of aircrafts flying to honor our the men and women who serve in our military. So this year, as you celebrate your 4th of July from the beautiful beaches of South Carolina, look up and SALUTE. It’s a simple way to participate and to say thank you to our armed services. It’s never too late to start a new tradition and make memories that will last a lifetime.